It is expedient that we redouble our efforts as Biafrans, for the full and total restoration of our nation - Biafra, both in truth and in honesty. Failing in this bid, will not only spell doom, but will amount to trifling with the invaluable sacrifices of our fallen heroes and heroines who were gruesomely murdered by the murderous security agents of the Nigerian state. We must therefore, remain resolute in this restoration struggle not just for the freedom of our nation but for the safety, security, protection and preservation and that of our upcoming generations. We must not mortgage our future with undue complacency and the fear of the wicked haunting spree of the Hausa-Fulanis. Biafra has been given to us by God as a people and the restoration of that should remain our consuming passion until it's realisation. This of course as ordained by the Almighty God, will be a spectacular miracle on this earth. It is a divine project which must be driven to it's logical end, which no being can truncate. The future of Biafrans is totally guaranteed as citizens in their own nation where freedom, justice and equity will be esteemed. Biafra when fully restored, will be one of the most viable, enviable and strongest nations. Countries of the world whose lack lustre attitude towards the speedy resolution on Biafra restoration which they earlier foresaw, to a wider extent, has been showcased indifferently with dangerous politics of selfish interests despite our plights. There has been a retinue of hindrances on the way but most assuredly, the task must be actualized in line with the prophesies that had been declared. Besides, several visions had been issued about the coming Biafra as a great nation, and without any disputation, must be fulfilled. God Himself equally revealed it to men of integrity and dependability amongst whom is our very own courageous and highly enlightened Leader, Mazi Nnamdi Kanu. Biafra will be a nation that other nations of the world would consistently be in consultation with for ideas on very salient and all encompassing issues of interests as the blessed of God. Oh, I foresee the joy that will reverberate the entire Biafraland as this unique nation fully comes on stream. It is unimaginable! We have lost every comfort if there was any, in this British evil enclave called Nigeria where there is absolutely no value for human lives. People are gravely marginalized, lawlessly arrested, incarcerated and killed at will. All these because we were forcefully lumped together with whom we are incompatible by the British. 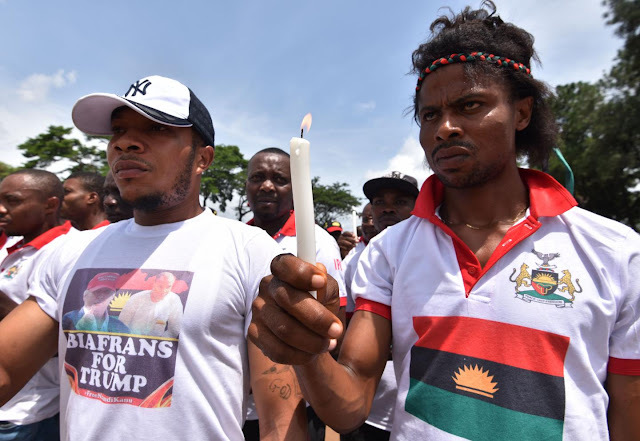 The Hausa-Fulanis who see Nigeria and power as their birthrights, have over the years, been on steady maiming and killing spree against Biafrans They in their evil scheme have tagged us - Indigenous People of Biafra (IPOB) as terrorists for carrying out our freedom struggle which has been acclaimed world most peaceful, civilized, enlightened and well organized mass movement, in the exercise of our fundamental human rights as required by law. Many of us have either been unlawfully imprisoned in various detention centres, both known and unknown, maimed or killed for this cause by the this Hausa-Fulani run government of Nigeria. Presently, the whereabouts of the leader of the Indigenous People of Biafra (IPOB) worldwide - Mazi Nnamdi Kanu and his parents abducted by Nigerian Soldiers following their vampiric invasion code named "Operation Python Dance II, of their residence at Afaraukwu-Ibeku, Umuahia, Abia state, on the 14th of September 2017, are yet unknown till date. The Nigerian government's policies towards Biafrans over have been unbearably oppressive and enslaving. Biafrans have been terribly under the yoke of the enemies. We have occasionally and systematically being slaughtered and incarcerated by the agents of the British. Oh God, remember the promises You made to us Your children through our father - Abraham, and come to our rescue. We will serve You uncompromisingly Lord as You get us duly restored in the land You freely gave to us. Generations of Biafrans will most certainly serve You! Biafrans, arise and do not relent!